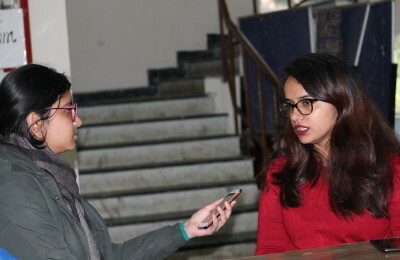 Festivities were the theme of the week at Indraprastha College for Women as the college organised its Annual Production, Reshmi Roomal on 10th of March and its annual cultural fest, Shruti 2016 on 11th and 12th of March. Reshmi Roomal, a women-centric play, addressed the roles of housewives and the household through strong characters like Sulakshana, and Foofi, played by Ashwini Thakur and Kanupriya Agarwal. The play was written by Professor Tripurari Shartha, produced by IP College for Women and directed by Asif Ali. The inauguration ceremony of Shruti 2016 on 11th saw Alaap, the classical music society of the college open the fest. At Rhapsody, the western group acapella competition, Kamala Nehru College stood first, while the 2nd and 3rd positions were bagged by Lady Shri Ram College and Gargi College respectively. Whacky feet was a befitting finale to the competitive events, with Miranda House bagging the 1st prize. SGGSCC and IIT-D followed. Other competitive events included Taboo by Oghma, The English Editorial Society. Women’s Development Cell organised Stagecraft, a creative enactment competition. A team from Satyawati and Maharaja Agrasen won, while the other positions were bagged by teams from the host college. The day ended with Dhruv Sufi Project taking the stage. Day 2 began with the street play event Chauraha ’16, while the Indian music society hosted their Annual Indian music fest Ninaad. The 1st position in the Indian Classical choir was bagged by Daulat Ram College followed by Institute of Home Economics and Kamala Nehru College. Sri Venkateswara College won the Folk Dance competition, while Gargi came a close second. 3 a side Basketball, was won by Kirori Mal College and VIPS. The Star Night saw students in the college grounds tapping their feet to Bollywood music by Akhil Sachdeva and his band Nasha.